They Set Out to Raise $20,000 With Crowdfunding And Ended Up Raising More Than $10 MM. Here's What Happened Next. Hiral Sanghavi and his wife Yoganshi Shah launched a Kickstarter campaign to raise money to fund the production of the all-in-one travel jacket they invented together. The goal they published on the Kickstarter campaign website was $20,000. To date, they have raised more than $10.6 million. By any measure, that’s blockbuster, exponential, super-crazy success. Also, it means that Sanghavi and Shah now need to manufacture and produce 80,000 jackets. That’s no small order. That’s a lot of jackets. And, that’s a lot of very complicated jackets to make, too. The BauBax travel jackets have fifteen unique and highly customized features all designed to make travel more convenient. For example, the BauBax jacket includes a built-in neck pillow, a koozie drink pocket and iPad pocket, among other features. Also, the travel jacket comes in four styles for both men and women: windbreaker, bomber, sweatshirt and blazer. First, Sanghavi had to put off school. He launched the Kickstarter campaign as a part of his MBA Summer Internship program at Northwestern’s Kellogg School of Management following his first year of classwork. He intended to go back to school in the fall and work on fulfillment while he was in his second year of classes. As the campaign picked up speed, barreling through the coveted $1 million mark, Sanghavi soon realized he wouldn’t be able to manage both getting his MBA and running a startup that was absolutely exploding. Next, Sanghavi and his wife needed to raise money to operate before the crowdfunding campaign funds came through. Shah cashed out the stock she had bought with her personal savings. The couple borrowed from friends, family in both the U.S. and India, and from Sanghavi’s professors at Kellogg. In total, the couple and co-founder duo raised $700,000. Also, Sanghavi hired a marketing company that agreed to be paid once the Kickstarter funds came through. Then they started putting together a team. They started with LinkedIn. Sanghavi entered in the LinkedIn search tool the fashion and manufacturing skill set he was looking for. It wasn’t all that hard to lure talent because the crowdfunding campaign demonstrated clearly that BauBax was onto something hot. 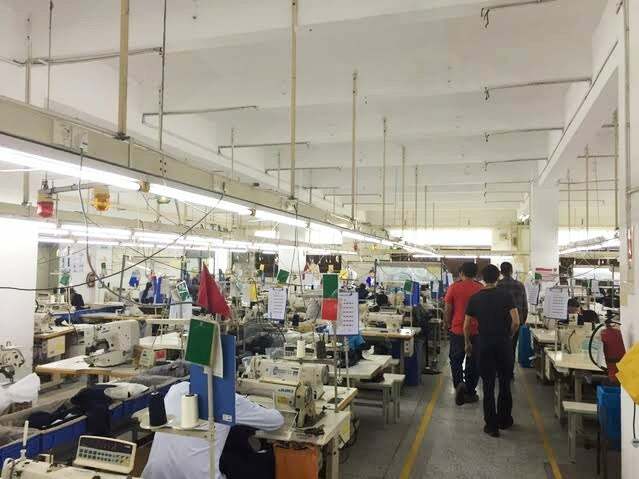 Inside one of the factories in China where the Baubax jackets are being manufactured. Sanghavi and Shah assembled a team of six full-time employees and a handful of contractors and moved the company headquarters to Berkeley, Calif., from Chicago, Illinois, where Sanghavi had been in school. As Sanghavi and Shah launched the company with their life savings and on borrowed funds, there was a string of pretty anxious days. Sanghavi had seen some campaigns suspended for violating Kickstarter’s rules. The Kickstarter campaign came to a close on Sept. 3 and two weeks later the money raised with crowdfunding was deposited in the BauBax bank account. Since the Kickstarter campaign ended, Sanghavi and Shah re-opened their campaign on rival crowdfunding platform Indiegogo as part of a program the San Francisco-based platform calls “InDemand.” It’s for successful crowdfunding campaigns looking to continue to accept pre-orders after their initial crowdfunding window closes. Once the money from the Kickstarter campaign landed in the company’s bank account, the team was able to finally order fabric, getting the production process officially moving forward. The race against the clock was on. Once you set the rewards, there’s no going back. So when Sanghavi launched the Kickstarter campaign with a goal of raising $20,000 over the summer, he promised delivery by November. The BauBax jacket’s record-breaking crowdfunding success got a lot of press (including from yours truly), and that helped Sanghavi because manufacturers from all across the globe reached out and pitched their services, pricing and quality. The new team’s first task was to analyze the roughly two dozen estimates that poured in from manufacturers across the globe and start to analyze who would be best. The search took Sanghavi, Shah and two of their employees to China for the entire month of October. They interviewed many factories. And ended up picking 10. Not one, but 10. That’s how many they needed to manufacture the various parts and components of the jacket. And they were ensured that their orders would, indeed, be completed in time to meet the previously promised production schedules. Sanghavi updated the community of Kickstarter backers in early November that production was underway and the jackets were being produced. And then, just as soon as everything seemed to be set, the bad news broke. In mid-November, the factories in China came back to say that in fact, no, they would not have the jackets done in November, as previously promised. Sanghavi had to go back to the community of backers and tell them that jackets would not be delivered by November. “Our estimated delivery of November 2015 was set in July, before the launch of the campaign, for a target goal of $20,000,” the letter to the campaign backers says. Current, updated estimates are that jackets will be shipped out as they become available December through February. 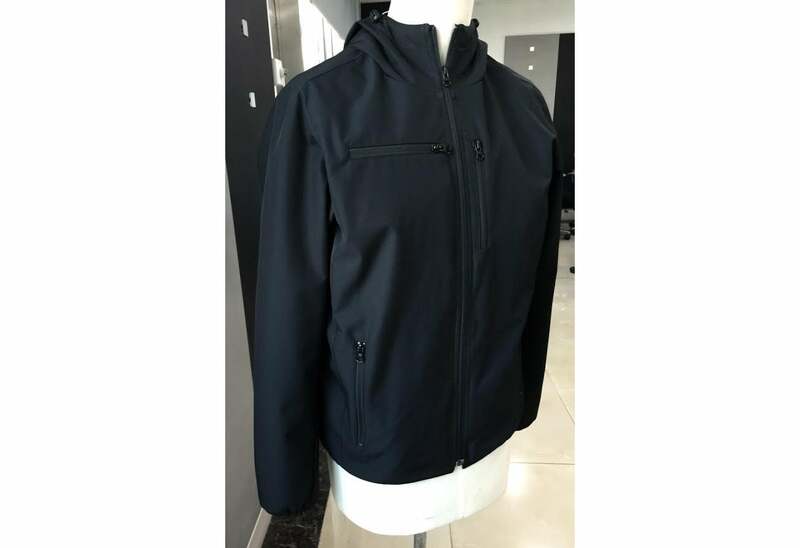 To make up some of the lost time by the delay in manufacturing, the BauBax team opted to have jackets delivered from China to the U.S. with air travel, not over the sea. It’s four times as expensive, says Sanghavi, and shaves margins paper thin, but the company decided it was worth the one-time losses to keep trust with the brand’s earliest adopters as intact as possible. The road from Kickstarter campaign launch to ordering the first 80,000 jackets has been nothing short of a sprint for Sanghavi and his team. But the inspiration to keep moving forward from one challenge to the next has come in unexpected places.